A team of UNC Charlotte researchers has been awarded a National Science Foundation (NSF) EArly-Concept Grants for Exploratory Research (EAGER) as part of the Real-Time Learning and Decision-Making in Engineered Systems (Real-D) program. Led by Associate Professor of ECE Valentina Cecchi, the 2-year $300k project is entitled “Visual Analytics for Enhanced Decision-Making and Situational Awareness in Modern Distribution Systems, with a Focus on Outage Prediction and Management”. Co-Principal Investigators are Tao Hong from the Systems Engineering and Engineering Management Department, and Zach Wartell and Isaac Cho from the Department of Computer Science in the College of Computing and Informatics. The project focuses on the integration of three main components: 1. 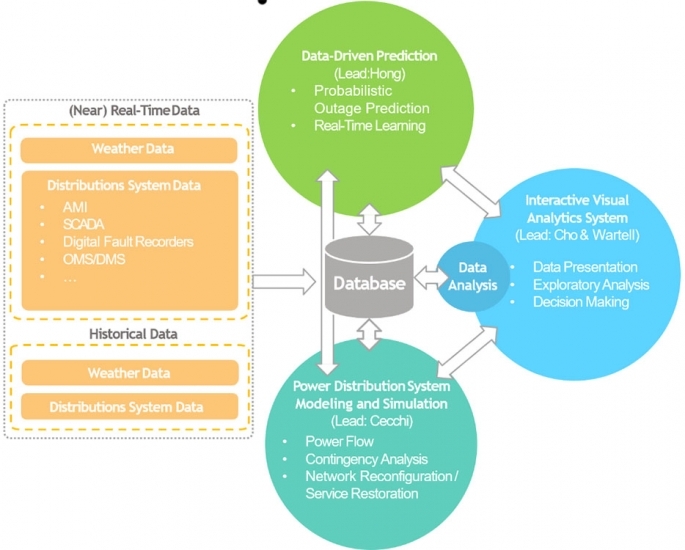 Data-driven real-time probabilistic outage prediction with weather data, 2. Situationally-aware modeling and simulation of the electric power distribution system, and 3. An interactive visual analytics system, to provide visual, prescriptive analytics. The focus will be on real-time probabilistic outage prediction and subsequent outage management strategies. The developed approach will enable and enhance fast and confident decision-making, thus supporting overall efficiency and reliability improvements in distribution systems, reducing outage times and improving reliability indices. The project will also lead to a new approach to handling big data in the electric grid, and to new directions in associated engineering and computing disciplines applied together to the power industry.